If you travel by car, you can stop free of charge in front of the departure or arrival terminal for getting in or out and for loading or unloading (at road level). The taxi stand is also located in front of the terminals. Seriously disabled persons with an exceptional disability (“aG” entered in pass in Germany), drivers as accompanying persons for blind persons (“Bl”) and helpless persons (“H”) are allowed to use an extra wide “disabled parking lot” on parking deck “0” in multistory car parks P1, P2 or P3. A 50 % discount is granted off the normal parking fee. Economy tickets for holiday parking are not credited in this case. Persons with a slight disability (“G” entered in pass in Germany) have no legal claim to an extra wide “disabled parking lot” or discount. The maximum height for vehicles entering our multistory car parks is 2.10 meters. Please use car park "P6" if your vehicle is larger than this or a high vehicle. Please refer to the information board at the entrance. Travellers with reduced mobility can obtain assistance in making travel arrangements and on entering, changing or leaving trains in stations by contacting the Mobility Service Center of German Rail. To enable the service staff of German Rail to organize the assistance reliably, it is recommended that the Mobility Service Center is notified in good time (at least one working day in advance). You can reach the airport from the Nuremberg main rail station on the U2 subway without changing trains. You can reach the airport from the main rail station on the U2 subway without changing trains. A wheelchair lift provides access to the airport terminals from the subway station (“Flughafen”). 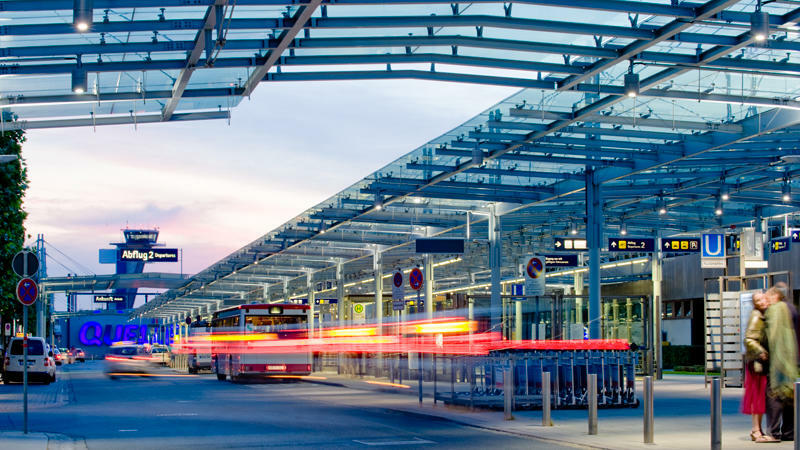 Besides the subway connection, you can also reach the airport easily using the Nuremberg bus network. The bus stop for lines 30 and 33 is located in front of the departure and arrival terminals.